Vehicle: Size H; Strength 8; Flight 8, ALT - Swimming 8; Defense 6 (-4); Toughness +17. Improvised Weapon: +8 • Close Damage DC 33 (Strength-based), descriptor varies • Split 1. Last edited by CaptainKaulu; 09-06-2018 at 10:12 AM. Headquarters: PL5, Size H, Toughness +10. Smuggler's Light Pistol: +4 • Ranged (75/150/300 ft) Damage DC 18, piercing/ballistic. Sword-Cane: +4 • Close Damage DC 18 (Strength-based), piercing/slashing. Motivation - Curiosity: Wants to know everything about outer space. Eccentric: Lots of money seems to make people a bit quirky. Dr. Astro Remanasuarez, man of complex background, former college professor, sporter of goatee and mustache. He's not a superhero, but rather the founder and sponsor of one of the world's premier superhero teams. If you can call them "the world's" anymore—they spend their time in outer space, the frontier that occupies Dr. Astro's fascination. Last edited by CaptainKaulu; 09-06-2018 at 10:13 AM. Headquarters: PL16, Size H (castle), Toughness +32 [Impervious 29]. Immunity 10 (teleportation and dimensional movement). Baleful Minify: +16 • Ranged (400/800/1600 ft) Shrinking Attack 16 (Fortitude), magic • Distracting, Continuous. Energy Cone: Dodge DC 25 • Close (120-ft Cone) Damage DC 30, acid/cold/electricity/fire/sonic • Selective. Energy Explosion: Dodge DC 25 • Ranged (375/750/1500 ft) Area (60-ft Burst) Damage DC 30, acid/cold/electricity/fire/sonic. Entangling Vine Ray: +16 • Ranged (400/800/1600 ft) Affliction DC 26 (Dodge/Damage or Sleight of Hand; Hindered & Vulnerable / Defenseless & Immobilized), plants • Cumulative, Secondary Effect. Petrification Ray: +16 • Ranged (400/800/1600 ft) Affliction DC 26 (Fortitude; Dazed & Vulnerable / Defenseless & Stunned / Transformed & Unaware), petrification • Cumulative. Orphan: Melafalin (or "Melf") was an only child. A white dragon raided his home and ate his parents. Relationships: Melafalin has numerous important and personally-close subjects, including acting-emperor Herky (a Half-Elven Fighter/Mage/Thief). More importantly, he has a wife (half-fey) and quadruplet children to take care of. Responsibility: Commensurate with his Status advantages. Fame: He's pretty famous on his planet. Power Loss: Much of Melafalin's power comes from his magical items. While they cannot be stolen or destroyed, he is much weaker if he can be caught having voluntarily removed them for some reason. TBA ... maybe. His character wasn't that deep. Just like Thorpocalypse's character, Melafalin gained access to an extra-powerful Wish, and wished for 25s in all stats, the maximum that could be attained in 2e AD&D. So that translates to all 7's here. Except Fighting, which is even higher, as it wasn't an ability score in D&D. But Melafalin also got a second extra-powerful Wish ... and wished that none of his equipment would ever be stolen or destroyed. That's why most of it doesn't really qualify for the Removable flaw, and in fact pays 1 extra point for the fact that he can separate himself from it if he wishes to. (This is like having an Alternate Effect on each piece of equipment that applies Affects Only Others.) He can still be Disarmed, so two of his powers have the Easily Removable flaw, but they have Unstealable Features making them just as expensive as if they were only normal Removable. Trust me, the original Watchful Eye was a lot MORE powerful. Thanks to the inherent balance in M&M (at least compared to tweens who don't even follow the AD&D rules very closely), it's been toned down a lot in this incarnation. Most of the Offense section of this post is in .png form due to something (or multiple somethings) in it triggering the forum's Front Page Bug. Last edited by CaptainKaulu; 09-26-2018 at 04:22 PM. Unarmed: +12 • Close Damage DC 18 (Strength-based), bludgeoning. Talons: +20 • Close (10 ft) Damage DC 27, slashing • allows Grab attempt as a free action. Grab: +4 • Close • DC 19 (with a -5 penalty to escape). Rake: +20 • Close Damage DC 27, slashing • Grab-Based, Reaction (to establishing or maintaining Grab). Relationship: Squeet has bonded itself to the elf Melafalin. Originally a pair of demigods and two animals ... the four souls were merged together by an uber-powerful Wish, which prevented some of them from perishing due to mortal wounds. Melafalin's noble steed and utility tool extraordinaire (as he can assume many magical abilities by taking the correct shapes). Last edited by CaptainKaulu; 09-26-2018 at 04:23 PM. Headquarters: PL9, details and features TBD. Vehicle: Size M, Strength 2, Speed 6, Defense 10 (+0), Toughness +10. Features: Nav System • Oil Slick. Diamond Stiletto: +13 • Close Damage DC 20, piercing, crit 17-20 • Penetrating DC 16, Precise. Carbon-Needle Gun: +13 • Ranged (125/250/500 ft) Damage DC 20, piercing. Carbon-Nanotube Flurrying Flail: +13 • Close Damage DC 20, slashing, crit 19-20 • Multiattack. Carbon-Nanotube Barbed Lash: +13 • Close (+15 ft) Damage DC 20, slashing, crit 18-20 • ignores Cover. Entangling Carbon-Fibers: +13 • Close Affliction DC 15 (Dodge/Damage or Sleight of Hand; Hindered & Vulnerable/Defenseless & Immobilized), entrapment • Cumulative. Graphene Bubble: +9 • Close • Dodge DC 19 vs being trapped in bubble. Tear Gas Pellets: Dodge DC 15 • Ranged (25/50/125 ft) Area (15-ft Cloud) Affliction DC 15 (Fortitude; Dazed & Impaired / Disabled & Stunned / Incapacitated & Unaware), chemical. Flash-Bangs: Dodge DC 15 • Ranged (25/50/125 ft) Area (30-ft Burst) Affliction DC 15 (Fortitude; visually & audially Impaired/visually & audially Disabled/visually & audially Unaware), light & sonic • Cumulative. Adhesive Foam Grenades: Dodge DC 14 • Ranged (20/40/100 ft) Area (30-ft Burst) Affliction DC 14 (Dodge/Damage or Sleight of Hand; Hindered & Vulnerable/Defenseless & Immobilized), adhesive foam • Progressive, Activation 1 (move action). Explosives: Dodge DC 16 • Ranged (60/150/300 ft) Area (30-ft Burst) Damage DC 21, explosive • Affects Insubstantial DC 18. Sleep Gas Pellets: Dodge DC 15 • Ranged (25/50/125 ft) Area (15-ft Cloud) Affliction DC 15 (Fortitude; Dazed/Stunned/Asleep) • Cumulative. Smoke Pellets: Dodge DC 14 • Ranged (40/100/200 ft) Area (15-ft Cloud) Concealment Attack 4 (all visual senses), smoke. Motivation - Doing Good: Thelonious despises the way the poor people are cruelly oppressed by the Five Houses, and wants to oppose it. Divided Loyalty: Thelonious wants the new team to succeed -- but his true loyalty lies with the DA, Ning Zhi. He is worried for Zhi's safety without him as a bodyguard, but is under orders to join the new team and covertly report back on their activities to Zhi. Zhi doesn't trust Dark Angel. Racism: Thelonious has a hard time trusting Italians or even believing that a Italian isn't associated with organized crime. Relationship: His girlfriend, Tabatna, a waitress. Vow of Temperance: Thelonious disdains personal wealthiness. He refuses to get rich by creating diamonds, even when it would be very convenient (although it would be more difficult than it seems, thanks to the Five Houses' ties with corrupt diamond cartels who control the market). If Thelonious is offered a reward beyond his normal pay, his instinct is to refuse it. Proto-Sentient Nanites: Thelonious lives in fear that someday, his cybernetic side will develop sentience and motivations of its own and influence his behavior. Named for the noteworthy jazz pianist Thelonious Sphere Monk, Mr. Syver doesn't remember much of his parents beyond their love of jazz, which he tries to honor. A native of NBC, Thelonious grew up as an orphan. With financial help and encouragement from Umbra, Thelonious went on to graduate high school, then college, studying IT. Truth be told, he kind of coasted through college, relying on his natural brightness and not studying a whole lot. Through his mid-20s, he worked as a cop, but hated it, as he soon discovered that the police force as a whole was corrupt. This was a very repressed and angry period in his life. Finally he quit, and went to work as a lowly security guard. At the age of 28, Thelonious started to notice that sometimes he would get impressions from inanimate objects, as if they were whispering to him. He contacted Umbra again, who referred him to Eclipse (who was closer at the time), and Eclipse helped the younger man explore his new abilities and eventually train with them. Now on the path to becoming truly competent in combat, he sought out Ning Zhi, whom he had long admired, and procured a position as a bodyguard (as Zhi was facing threats on his life at the time, which is hardly unusual for him). The two have grown quite close as "Mr. Syver" has saved Zhi's life a few times, and grown to admire his staunch integrity more and more. Thelonious isn't thrilled about "abandoning" Zhi (on Zhi's own orders) to be cared for by other bodyguards, but he'll do it, and try to do some good in the city in the process. The latest event in Thelonious's life before joining the new team is that he has started to date Tabatna. It's a promising but still-new relationship. As for Element Six's abilities ... he is a carbon manipulator. The liquid siphoned into his ear was a self-replicating suspension of nanites made of graphite (as the experimenters didn't have access to "higher" allotropes of carbon at the time). Over 21 years, the nanites in his system, whatever their original purpose, had spread throughout his body -- nervous system, bloodstream, and all -- and evolved to include other carbon allotropes, such as buckyballs, graphene, and nanotubes. With the advanced molecule-sized machinery possible through these atomic structures, the nanites gained a collective proto-sentience. So besides the nanites' self-preserving tendency to repair damage done to his body, Element Six can "talk" to carbon; he can get impressions from it of what it's "seen" and "heard" in its immediate surroundings, sense its molecular structure in detail, and (if he's touching it) command it to rearrange its structure atom-by-atom. Thanks to complex impurities in a typical body of carbon, re-arranging it is a relatively slow process. However, over time, he can work out all the impurities and bond deeply with a particular body. His bond with his weapon/tool is so deep that he can re-factor it as a free action, and can do tricks like absorbing part of its mass into his body or producing extra bits of carbon to use as projectiles. Perhaps his most inexplicable ability is to summon his motorcycle out of thin air. This motorcycle was gifted to him by Eclipse, and has some extradimensional bond that Eclipse was reluctant to explain in detail. So Thelonious doesn't know where the cycle goes when he dismisses it, or how it can relocate when he calls upon it. Fortunately, the steel that makes it up has a fair amount of carbon in it, which has allowed Thelonious to bond with it enough to make it more resilient than a typical motorcycle, and (even better) allows him to repair it when it's summoned. Since developing his powers, in his spare time Thelonious has attempted to cram as much of the science of nanotechnology into his mind as he can. Element Six's pupils turn silver when he uses his abilities. Concealable and Dangerous are from the Archaic Weapons Gadget Guide. Summonable vehicles are from the Vehicles Gadget Guide. Summonable 2 means that his motorcycle will be restored to working condition whenever he re-summons it. Element Six did not get accepted to the game I submitted him to, but I'll still put him here on my repository of builds. Headquarters: Size D, Toughness +6. Features: Infirmary • Living Space. Vehicle: Size H, Strength 8, Flight 8, Defense 6 (-4), Toughness +11. Extras: Increased Range 1 (ranged), Multiattack. Unarmed: +18 • Close Damage DC 17 (Strength-based), bludgeoning • allows Grab attempt as a free action. Grab: +6 • Close • DC 24 (with a -5 penalty to escape). Shuriken: +15 • Ranged (100/200/400 ft) Damage DC 20, piercing/ballistic • Multiattack. Sniper Rifle: +15 • Ranged (2000/4000/8000 ft) Damage DC 20, piercing/ballistic, crit 19-20. Helicopter Rockets: +11/Dodge DC 16 • Ranged (225/450/900 ft) Damage DC 24 on direct hit or Area (30-ft Burst) Damage DC 21, explosive. Helicopter Machine Guns: +14 • Ranged (150/300/600 ft) Damage DC 21, piercing/ballistic • Multiattack. Motivation - Thrills: Dex used to be obsessed with shooter video games and medical drama shows, but eventually got tired of both, and now finds thrills in acting out those same situations in real life. He finds the adrenaline of operating on a patient exhilarating, as well as wrestling for his life. Quirk: Dex refuses to sully his amazing hands with handshakes with lesser creatures. Of course building a build based around Dexterity (infamously not worth the points you put into it) was a difficult task, and given how fast I ran out of points before I could add a bunch of thematic (if not mechanically-bound to Dexterity) Powers to the build, I'm not sure I succeeded. The result is a "superhero" with the steadiest hands ever; he has a decent helicopter, is a pretty good doctor, and has a few PL-appropriate ranged attacks. Then there's his "broken" combo: attacking with a +18 attack bonus to apply a DC 24 Grab, due to the interesting interaction between Fast Grab and Grabbing Finesse. This is way beyond the normal PL limits for grabbing. But are these few abilities enough to let him hang with other PL10 superheroes? I'm skeptical. We'll see if I come up with ways to shave off a few points here and there and replace them with anything beefier. Last edited by CaptainKaulu; 09-26-2018 at 08:00 AM. Unarmed: +14 • Close Damage DC 20, bludgeoning. Improvised Weapon: +14 • Close Damage DC 21, descriptor varies. Thrown Rock: +14 • Ranged (125/250/500 ft) Damage DC 21, bludgeoning. A stone-textured, featureless humanoid of a muscular build. Probably the Aspect that Aspect summons the most often. While this build is clearly defensive overall, it does have PL-appropriate attacks (with not much in the way of extra frills), allowing it to be a relatively well-rounded form, appropriate to being Aspect's most frequent companion. Requires an exotic sense to detect. This Power is taken from the Mental Power Profile. Since Energizing Healing does not normally work on one's self, I think it is safe to assume that the Healing part of this power is only effectual if the Affliction half succeeds. While the swarm itself is plainly visible unless using Stealth, requires an exotic sense to detect that Prof. Burlov is the source of the swarm. Unarmed: +1 • Close Damage DC 14 (Strength-based), bludgeoning. Seize Mind: Perception-Ranged Affliction DC 20 (Will; Dazed/Compelled/Controlled), mental/magical • Cumulative, Distracting, Subtle 1. Psychic Vampirism: Perception-Ranged Affliction DC 17 (Will; Fatigued/Exhausted/Incapacitated), mental/magical • Cumulative, Subtle 1 • if successful, triggers Linked Self-Energizing-Healing. Secret: Professor Burlov isn't actually a brilliant scientist/inventor/gadgeteer, as the world thinks; he's a sorcerer, feeding off a Lovecraftian Old One. He has to maintain the facade of a mad scientist and science professor. He is reluctant to use Summon Insectoid Swarm or various eldritch-themed Power Stunts around those he doesn't trust, although it's hard to concretely identify the source of such powers if they're Subtle. Motivation - Thrills: If Boris wasn't already crazy enough to want to risk his life repeatedly, contact with an Eldritch Horror has provided such insanity. Prejudice: Not only is Graystuff's variety of sorcery looked down upon, but his true appearance is disturbing even to those who think he is merely a mad scientist. 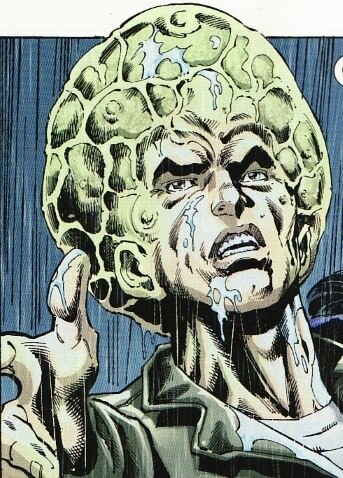 His head is a massive, swollen brain, with tiny tentacles (useless in combat). Hence the nickname "Graystuff" amongst those who have seen him uncovered. To make things smoother as well as to maintain his gadgeteer facade, he normally operates in costume, a sleek high-tech-looking suit -- which fails to hide the fact that he's a scrawny person with an oversized head. This suit ostensibly provides his mental abilities and lesser force field. Phobia: Dogs, particularly hostile ones. Power Loss: Imbibed drugs that inhibit mental abilities exist. Professor Burlov grew up quietly in a Russian neighborhood in the Pacific Northwest. He's always been interested in Eldritch powers, but has also always been careful to keep his consorting with such powers a secret. Therefore, it's pretty hard for enemies to research his past. His eldritch patron is named Ya'Quarsh'sh. It's a sleepy entity, not trying to make a powerful comeback into the world as far as Graystuff knows. But consorting with it has had inevitable side effects -- his monstrous appearance behind his helmet/mask. After going to graduate school in Moscow, Graystuff has returned to Freedom City, near his hometown, and has spent a couple years now teaching as a science professor at the University to build up his facade. His suit is the product of his PhD dissertation "research," even though it represents nothing novel in terms of actual scientific innovation; he used his Deception skill to pull the wool over his PhD committee's eyes about what the suit could do. Boris is in his mid-thirties. I thought about making the build simpler by giving it an Area Damage power rather than a Summon Power; cost-wise, it would work out about the same, and would accomplish the primary purpose of the Insectoid Swarm. So I can switch the build to that at the GM's preference. But I thought it was more interesting if the Insectoid Swarm can be attacked by energy/area effects, and can be used for scouting, and so forth, as a Summoned entity rather than as an insectoid descriptor for a mere Damage power. I borrowed several ideas from the Mental Power Profile. Rend: Dodge DC 18 • Close Area (60-ft Cloud) Damage DC 23, piercing/poison • Selective, Incurable. Grab: +7 • Close • DC 15. A massive swarm of horrifying venomous bugs, about an inch long and looking like bats in some ways, with tiny tentacles instead of legs. When summoned, they crawl out of various nooks and crannies throughout the area as if they were there all along in the shadows, although in fact they are magical in origin. Just for fun, I spent a few points giving the Swarm a (relatively weak) Grab attack; it amuses me to think of a swarm of winged bugs trying to push enemies around, maybe drop them off of heights. The Swarm's defenses are horrible; if you can bypass its Insubstantial nature, you can probably get it to disperse without much trouble. Hopefully this will help keep it from being overpowered.